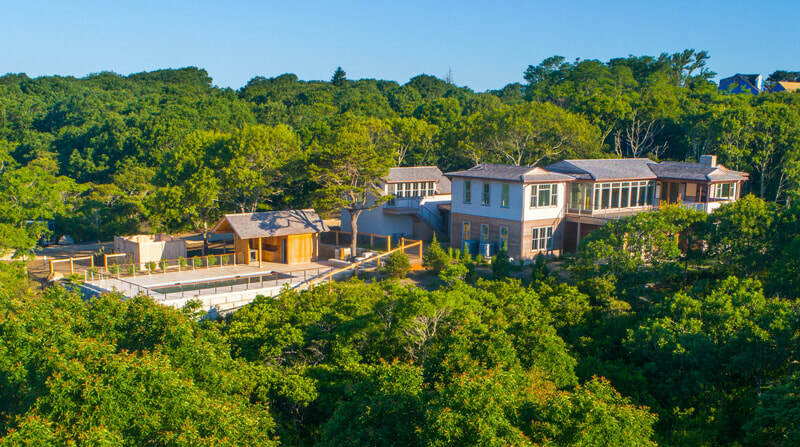 Up a gently sloping Aquinnah hilltop, a recently completed five-bedroom home designed by Breese Architects and built by Jay Bodnar and Nick Bologna of Vinland Construction is skillfully and sensitively integrated into its surroundings. 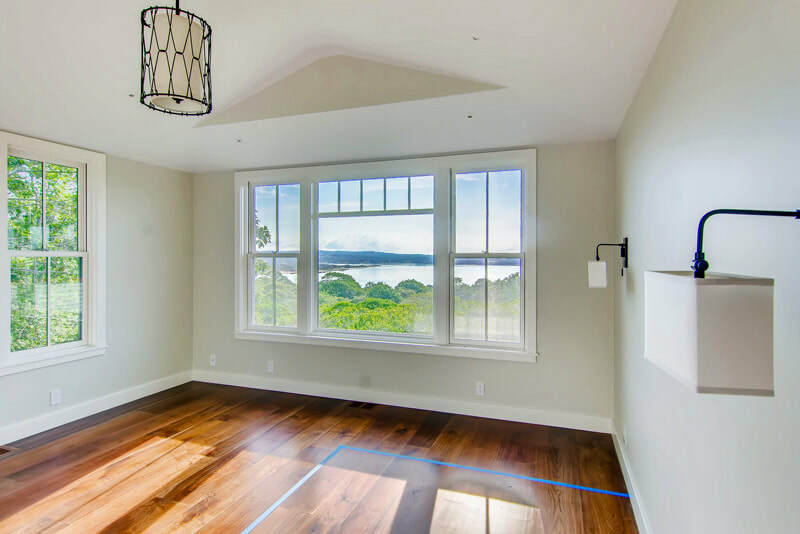 The commanding vista encompasses five bodies of water ¬– Menemsha, Quitsa and Squibnocket ponds, Vineyard Sound, and the Atlantic Ocean. Conservation land surrounds the property and ensures privacy and a protected view. The foyer reveals the open floor plan that takes advantage of the view from every room on the main level. 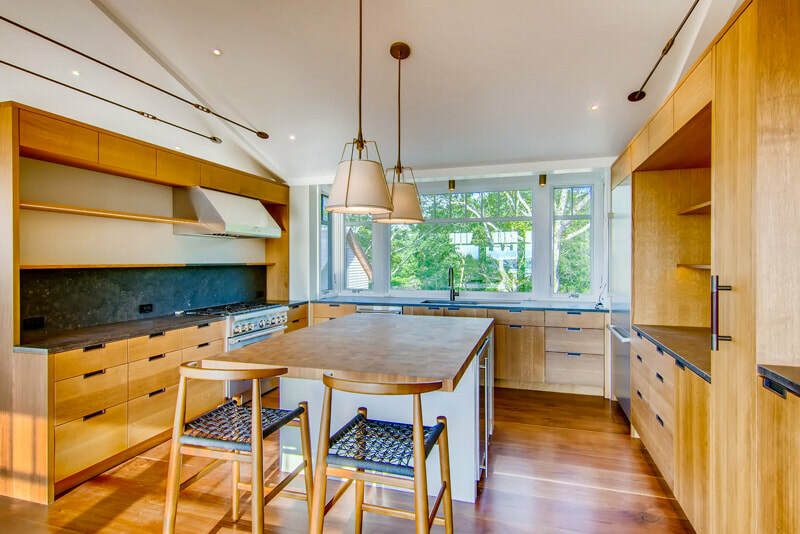 High-end custom construction includes walnut floors, railings, custom doors, cabinetry and countertops. Local master craftsmen included Against The Grain Cabinetmakers, Whit Hanschka metalwork and Will Parry doors. The interior was created by Mike Witt Interior Design. Soaring ceilings, unexpected angular forms and light-suffused rooms blend naturally to give an air of casual refinement that sets the tone for the rest of the house. 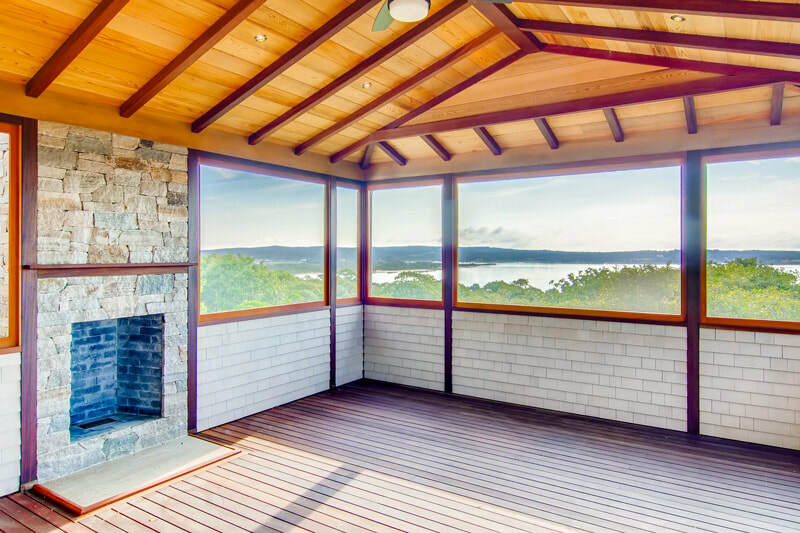 On this level, there are two bedrooms with en suite baths, a half bath, a screen porch with fireplace and a 30-foot deck off the porch. The lower level, with radiant heat throughout, contains two more bedrooms with en-suite baths, a family room, game room, laundry, mudroom, utility room and covered porch. A separate room with a peak of Menemsha Pond and its own full bath could be a study or yoga room. Solar energy is generated by SmartFlowers, ground mounted solar panels resembling flower petals that follow the sun throughout the day and were the first installation on the Island. These flowers are more efficient than traditional panels because of their tracking ability and it is estimated that these will provide the majority of the electrical usage to run this all-electric home. The detached one-car garage with bedroom suite above is adjacent to the heated gunite pool and pool house that includes an outdoor kitchen, half bath, changing room and an outdoor shower. ​ A short walk down the hill reveals a secluded beach on Menemsha Pond where the current owner has two moorings that will transfer to the new owners. As Aquinnah residents, there is also access to Philbin and Lobsterville beaches.